My work on PGA Tour Radio is something I cherish each tournament that I am assigned to. My co-workers are tremendous, the production is top notch, the golf courses are the best in the world, and I have the honor of delivering play by play and commentary of the best players in the world. Lucky me for sure! One of the byproducts of the gig is experiencing other parts of the country, and meeting new people. I don’t take this for granted. There are many people that rarely leave Buffalo, and when they do, it’s only to Florida for vacation. I always look forward to a new assignment, somewhere I haven’t been before. This week is such an occasion, as I’m in Jackson, Mississippi for the Sanderson Farms Championship. I’ve never been to Jackson, but have been to Mississippi before, but barely. I stayed in Biloxi for Super Bowl whatever, when the Patriots beat the Rams for their first title. So far, it’s been great, and the people are the reason. Southern Hospitality on full display. I got used to that when I lived in North Carolina, and I miss it. Speaking of North Carolina, something cool happened during the Pro-Am on Wednesday. Many tournaments will invite celebrities and athletes to participate in the day to attract more press and fans. The Sanderson Farms Championship invited two former NFL Stars, one from Mississippi, and one Georgia legend. You guessed right, Herschel Walker. We interviewed him for our show, and he could not have been nicer. He’s also still ripped. Meeting Walker was great, but it was the athlete for Ole Miss that I was more excited to see. During my two years in Charlotte, I was the Sports Director at WBT radio. 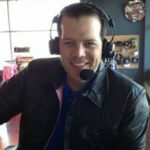 One of my duties was hosting a weekly radio show with a Panthers player. That guy was tight end Wesley Walls. Walls was one of the best tight ends in the game during his years with the Panthers. He was named to the Pro Bowl 5 times and finished his career with 450 receptions and 54 touchdowns. More importantly, he was a GREAT guy, excellent to work with. He took care of getting a different teammate each week to join us on location at a local sports bar, and would make sure I had the player’s number in case of any issues or questions. That is not the norm for professional athletes. I hadn’t seen Wesley in 16 years, so I was looking forward to saying hello. I hoped he remembered me. We did a weekly show together, so I was sure he would, but there are no guarantees. He was paired with Retief Goosen, teeing off on the front nine in the afternoon wave of groups at 12:20 pm. I worked my way towards his group from the back nine, as we had a few players to interview on that side of the course. After passing Davis Love III on the 4th tee, I headed towards the 3rd tee where Walls’ group should be just teeing off. They had just finished, and I easily picked out Wesley from the other amateurs in his foursome. He towered over the rest of them, a lean 6-5. I walked over to the middle of the fairway and stated “Mr. Walls, I’m not sure if you remember me?” He replied, ‘I remember that voice’. I extended my hand and said “I used to host your radio show on WBT, Kevin Sylvester”. A big smile came across his face, ‘You are bringing back some great memories right now’. We exchanged family updates, and what we’re both up to now. Just brief conversation, and a quick photo. We were in the middle of the 3rd fairway, no place for a long conversation. But it was one that I was glad we had, and thankful this job gave me the opportunity to have. For that connection alone, Jackson is a good trip. Nice article Kevin! Wesley Walls was “money”, don’t ever remember a drop, certainly not in an important moment!